According to MSNBC, as long as you tout left-wing talking points, it doesn't matter what kind of conspiracy theories you subscribe to. Ronan Farrow on Wednesday hyped the "fascinating" views of Jesse Ventura on Wednesday, including his opposition to building the Keystone pipeline and to call Republicans "hypocrites." CNN's Anderson Cooper targeted former professional wrestler Jesse Ventura in a Tuesday post on Twitter, after a jury awarded the ex-governor of Minnesota over $1.8 million in damages in a defamation lawsuit against the estate of former Navy SEAL Chris Kyle. Kyle's widow, Taya Kyle, is the executor of her deceased husband's estate. 'View' Crew Love 9/11 Truther Jesse Ventura: Run for President! ABC's mid-morning talk show The View has repeatedly featured anchors and guests who promote the debunked 9/11 truther movement. That tradition continued on Tuesday as conspiracy theorist Jesse Ventura appeared as a co-host. Although Whoopi Goldberg, Sherri Shepherd and Jenny McCarthy avoided Ventura's September 11th beliefs, the former Minnesota governor expounded on his other favorite conspiracy theory: the assassination of John Kennedy. CNN's Piers Morgan gave a (left) thumb up Friday to states legalizing marijuana and opposing a traditional marriage amendment. He joined conspiracy theorist Jesse Ventura in applauding the votes. "Well, Jesse, I can only say I totally agree with you on both the drugs and the gay marriage issue," Morgan said after Ventura declared "hoorah for Colorado," "Hooray for Washington," and "hooray for the state of Minnesota." Appearing on CNN's Piers Morgan Tonight, the former wrestler added, "That way it will show who owns them." For the second time in less than six months, Good Morning America offered 9/11 truther Jesse Ventura a platform to hype his conspiracy theories and smear the U.S. government as "Nazi." This occurred on the same day that GMA reporter Bianna Golodryga hit Republicans for having connections to birthers and wondered when the President will "fight back" against such charges. In contrast, although co-host George Stephanopoulos did press Ventura on his conspiratorial beliefs, he also joked around with the former Minnesota governor. At one point, he fawned, "You've had such a varied career. You were even once on a soap opera. Young and the Restless." Stephanopoulos then played a clip of the former politician on that show. Ventura appeared on GMA to promote his book 63 Documents the Government Doesn't Want You to Read. He slammed the U.S. government by attacking, "There are dedicated, patriotic people in government, but when you read this book, the scary part of this book for me, you could substitute the word Nazi and it would work." Stephanopoulos just moved on to his next question. For Joy Behar, saying Muslims killed Americans on September 11, 2001 is "hate speech," but saying the American government did it is perfectly acceptable and well within the bounds of civil discourse. That, at least, is the standard she set forth yesterday, first throwing a temper tantrum on "The View" when Bill O'Reilly noted the religious identities of the 9/11 terrorists, and then calmly sitting down to discuss the incident with 9/11 truther Jesse Ventura. "I question 9/11, I got a conspiracy theory." Ventura made sure to note at the outset. "So who's to say [Muslims] actually did [perpetrate the attacks] or not." Behar's response: "Well that's another thing, yeah" (video and transcript below the fold - h/t Allahpundit). (Updated with anti-Catholic "New Rules" jokes below.) Liberals complained this week when Rep. Michele Bachmann complained about "gangster government." But do they mind if the Catholic Church is compared to (and prosecuted like) the Mafia? So said former Gov. Jesse Ventura on HBO's Real Time with Bill Maher on Friday. MAHER: You did a movie called Predator. Let's talk about the Vatican. VENTURA: That's a predator, too. Never got me, though, the Vatican. An alien did. MAHER: My crazy radical friends Christopher Hitchens and Richard Dawkins say that if the Pope travels to England, as he is scheduled to in September, he should be arrested when he hits the tarmac. Now do you think that's going too far? VENTURA: ...I have another alternative, a question I've asked here in the United States. Why hasn't the Catholic Church been prosecuted under the RICO laws of organized crime? Professional conspiracy theorist (and former independent Minnesota Governor) Jesse Ventura hawked his book American Conspiracies on ABC’s The View on Wednesday. Barbara Walters plays a journalist on TV, so why would she spread horrific and unproven conspiracy theories on ABC? Just for the ratings? 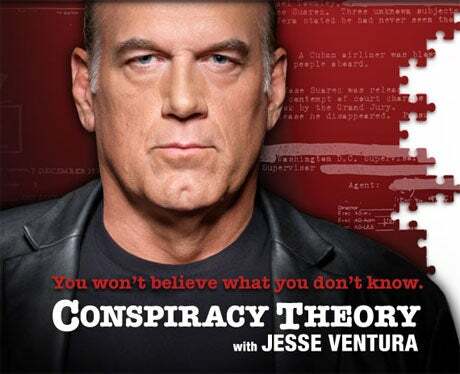 The View began with this promo: "Jesse Ventura’s blowing the lid off American conspiracies. Why he says you were lied to about the 9-11 attacks. How both George W. Bush elections were rigged, and why assassinations from JFK to Abe Lincoln were government coverups."